In a recent post (link here) I said that holding global temperature increases below dangerous levels would require “a mobilization of near-wartime scale and speed to transform the global economy and its energy and transportation systems.” Most climate scientists looking at carbon budgets agree that global greenhouse gas emissions need to fall to near zero in the 2040s (to hold temperature increases below 1.5 degrees Celsius) or 2050s (to hold increases to 2 degrees). So, how are we doing? BP (formerly British Petroleum) is one of the world’s leading sources for energy statistics and projections. This week’s graph is taken from the 2017 edition of its Energy Outlook. 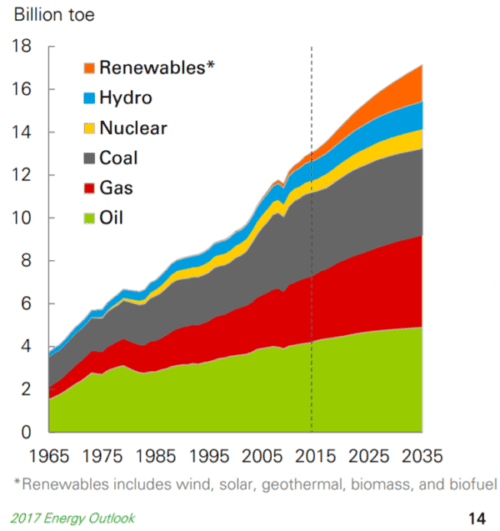 The graph shows BP’s projections of energy use to 2035, based on current trends. The picture is bleak. BP’s projections show oil use/combustion rising over the next 18 years. Natural gas combustion rises even faster. Even coal combustion increases. Not surprising, BP projects rising GHG emissions for the period from 2017 to 2035. But this is exactly the time frame in which we are supposed to be rapidly reducing emissions. If BP is correct, if we act in the ways they are predicting, there is zero chance of meeting the Paris commitments of reducing GHG emissions by 30 percent by 2030. And there is zero chance of holding temperature increases below 2 degrees. The picture BP paints, if we allow it to come to pass, would push global temperature increases past 3 degrees, or even higher. That would be a cataclysmic amount of warming. I’m told that fear and bad news are not good motivators. But neither are delusion or denial. We must stop telling ourselves fanciful stories about salvation by solar shingles. The citizens of the world need to know the facts about our situation and our trajectory. There is a vague feeling that we’re doing the right thing, that solar and wind power are growing so fast that we can meet our targets, that a modest carbon tax levied sometime in the future will be enough to put us onto the right track. No. Projections by BP and others tell a wholly different story. The facts indicate that we are on track to climate calamity. That may not be welcome news, but it is the truth. Whether it motivates people remains to be seen. In February 2017, global accounting firm PricewaterhouseCoopers (PwC) released a report on economic growth entitled The Long View: How will the Global Economic Order Change by 2050? The graph above is based on data from that report. (link here) It shows the gross domestic product (GDP) of the largest economies in the world in 2016, and projections for 2050. The values in the graph are stated in constant (i.e., inflation adjusted) 2016 dollars. PwC projects that China’s economy in 2050 will be larger than the combined size of the five largest economies today—a list that includes China itself, but also the US, India, Japan, and Germany. Moreover, the expanded 2050 economies of China and India together ($102.5 trillion in GDP) will be almost as large as today’s global economy ($107 trillion). We must not, however, simply focus on economic growth “over there.” The US economy will nearly double in size by 2050, and Americans will continue to enjoy per-capita GDP and consumption levels that are among the highest in the world. The size of the Canadian economy is similarly projected to nearly double. The same is true for several EU countries, Australia, and many other “rich” nations. 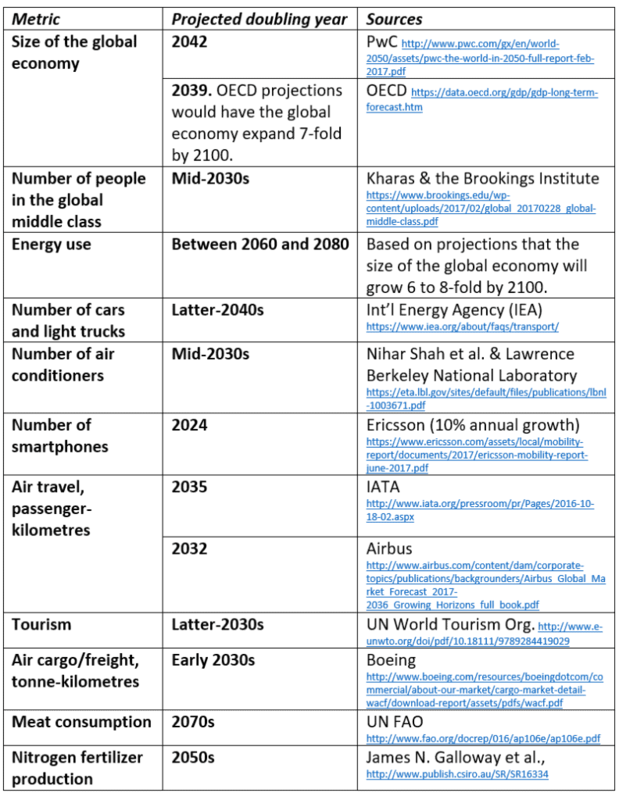 PwC’s report tells us that between now and 2050, the size of the global economy will more than double. Other reports concur (See the OECD data here). And this doubling of the size of the global economy is just one metric—just one aspect of the exponential growth around us. Indeed, between now and the middle decades of this century, nearly everything is projected to double. This table lists just a few examples. While we seem committed to doubling everything, the nations of the world have also made a commitment to cut greenhouse gas (GHG) emissions by half by the middle decades of this century. In the lead-up to the 2015 Paris climate talks, Canada, the US, and many other nations committed to cut GHG emissions by 30 percent by 2030. Nearly every climate scientist who has looked at carbon budgets agrees that we must cut emissions even faster. 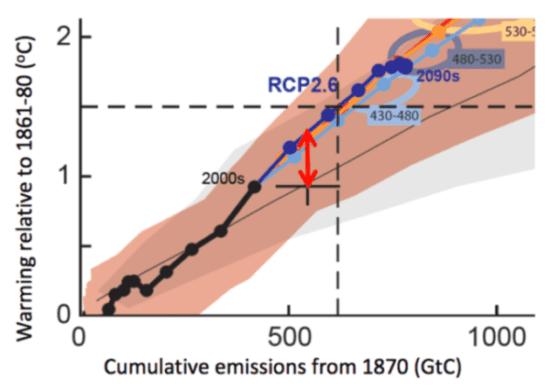 To hold temperature increases below 2 degrees Celsius relative to pre-industrial levels, emissions must fall by half by about the 2040s, and to near-zero shortly after. Is it rational to believe that we can double the number of cars, airline flights, air conditioners, and steak dinners and cut global GHG emissions by half? To save the planet from climate chaos and to spare our civilization from ruin, we must—at least in the already-rich neighborhoods—end the doubling and redoubling of economic activity and consumption. Economic growth of the magnitude projected by PwC, the OECD, and nearly every national government will make it impossible to cut emissions, curb temperature increases, and preserve advanced economies and stable societies. As citizens of democracies, it is our responsibility to make informed, responsible choices. We must choose policies that curb growth. A graph produced by Millar et al. illustrating their re-assessment of carbon budgets. The findings in the Millar paper are good news. Here’s why: they take away the argument that “it’s too late.” We still have it within our power to hold temperature increases below dangerous levels, spare low-lying island nations, prevent the inundation of rich river-delta agricultural lands in Bangladesh and elsewhere, retain the Greenland ice sheet, and prevent the worst ravages of climate change. Here’s the message everyone should hear: It’s not too late. But while it’s not too late, it is late. The other message people should take from this article is that we have no time to spare. Aggressive action is necessary now. If we are to save ourselves from ourselves we must embark on a mobilization of near-wartime scale and speed to transform the global economy and its energy and transportation systems. We need government-led mobilization for transformation. The article’s lead author, Richard Millar, wrote a commentary stating that “the window for achieving 1.5C is still narrowly open. If very aggressive mitigation scenarios can be implemented from today onwards, they may be sufficient to achieve the goals of the Paris Agreement.” (Find that commentary here.) At a press event he stated that holding increases to 1.5 degrees requires “starting reductions immediately and then reducing emissions to zero over 40 years.” Like nearly everyone else who has looked at this issue, Millar and his team have concluded that emissions reductions must begin immediately and emissions from the global economy must be reduced to zero by the 2050s or 2060s. So here’s where we are: Millar et al. calculate that we have the time (if only just). 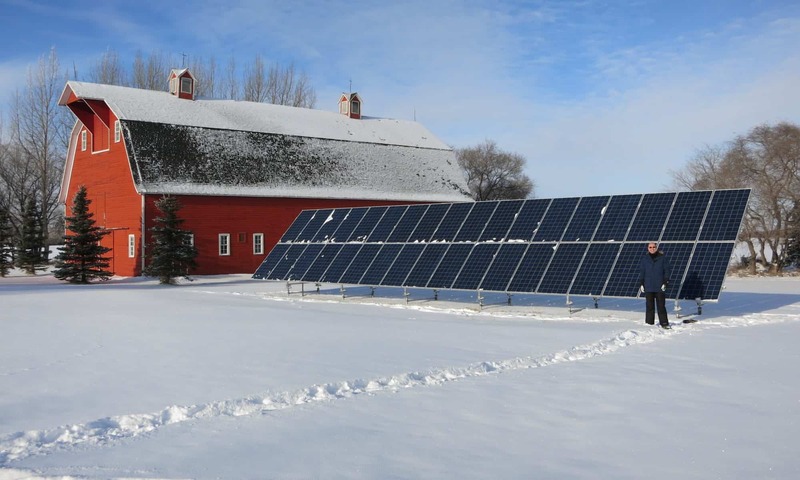 We have the technologies: solar panels, wind turbines, electric trains, net-zero and passive solar homes. We have historical examples of action on a similar scale: the WWII repurposing of the major industrial economies. And we have the productive capacity: a global manufacturing sector of unprecedented scale and output. Civilian and military aircraft makers must be compelled to immediately begin building trains. Auto makers must build electric cars. The home renovation industry must be redirected away from fantasy kitchens and home spas and toward energy-efficiency retrofits. And electrical utilities must rapidly replace GHG-emitting generation plants with near-zero-emission alternatives. And we must do all these things at rates that reflect that our future depends upon our success. The calculations by Millar et al. are sure to be controversial and closely examined. They may be revised. But the paper has weight because the team that wrote it includes many of the leading experts on carbon budgets. As climate scientist Glen Peter notes here: “the authors of this paper developed the idea of carbon budgets, are the world leading experts on carbon budgets, and derived the carbon budgets for the IPCC process.” We should all hope that Millar and his colleagues are correct in their reassessment. There’s a lot being written about China’s rapid push to install solar panels and wind turbines (e.g., see here). And as the US withdraws from the Paris Agreement, pundits have suggested that this opens the door for Chinese leadership on renewable energy and climate change mitigation (see here). 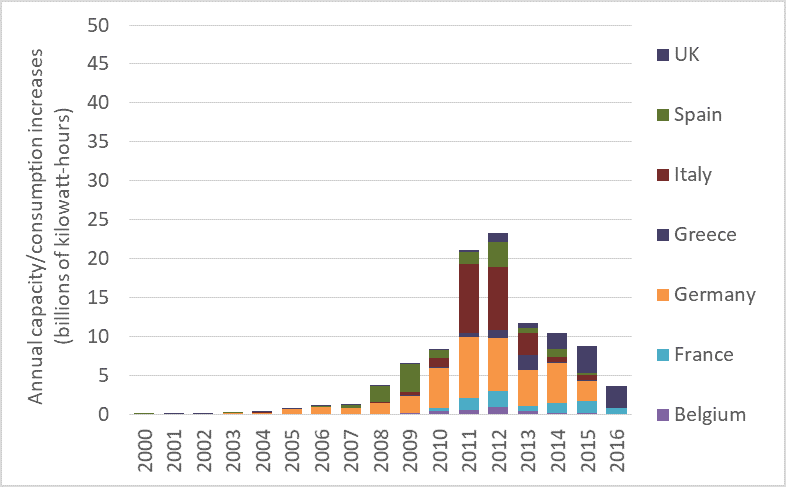 And China certainly has taken over global production of solar photovoltaic (PV) panels. But is this talk of China’s low-carbon, renewable-energy future premature and overoptimistic? Are we just pretending, because so little positive is happening where we live, that something good is happening somewhere? Chinese energy consumption data provides a corrective to the flood of uncritical news stories that imply that China will save us. This week’s graph shows how various energy sources are being combined to power China’s rapidly growing and industrializing economy. The units are “billions of barrels of oil equivalent”: all energy sources have been recorded based on their energy content relative to the energy contained in a barrel of oil. Similar data for Canada can be found here. US data is coming soon. Is the Chinese energy system being rapidly decarbonized? Is China powered by wind turbines? Or by coal? The data can support some optimism for the future, but at present, most of the news is bad. China remains the world’s largest consumer of fossil fuels and largest emitter of greenhouse gases (GHGs). Let’s look at the good-news-bad-news story that is China’s energy system. First, the good news: As is visible in the graph, China’s fossil fuel consumption has been flat-lined since 2013, and coal consumption is falling. Further, CO2 emissions have been declining since 2014. China has ceased, or at least paused, its rapid increase in its consumption of fossil fuels. China is also leading the world in the installation of renewable energy systems, especially wind and solar generation systems (see here). 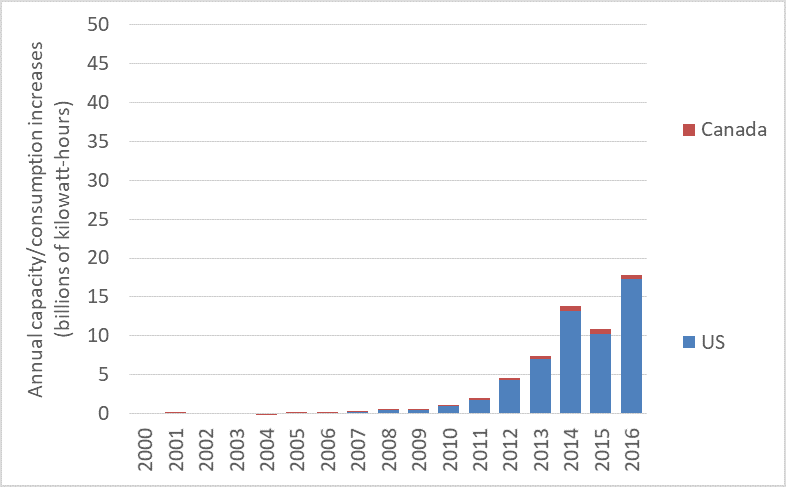 Chinese wind power production and consumption is growing exponentially—doubling approximately every two years. Solar power production and consumption is growing even more rapidly and has increased 25-fold in just the past 5 years. China has also invested massively in hydro dams, which can produce electricity with far fewer GHG emissions than coal-fired power plants. But it would be naive or premature to simple project Chinese solar and wind power growth rates into the future and conclude that the nation will soon slash its emissions. China’s coal-fired powerplants are relatively new and unlikely to be decommissioned prematurely. No matter how cheap solar panels become, installing new solar arrays will never be cheaper than simply continuing to produce electricity with already-built coal plants. Moreover, the graph makes clear that the current contribution of solar and wind to China’s energy system is small—about 2 percent of total consumption. 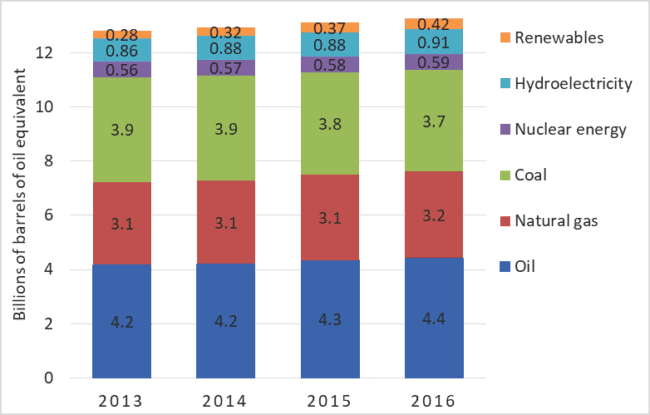 And while this portion will undoubtedly grow, there will be huge challenges for China as renewables make up a larger and larger percentage of its electricity generation capacity. With a less-than-state-of-the-art power grid, China will face difficulties dealing with the fluctuations and uncertainty created by intermittent power sources such as wind and solar power. Is China the leader we’re looking for? If so, it is a very odd choice. China has doubled its fossil fuel use and emissions since 2003. It is the world’s largest fossil fuel consumer and GHG emitter, and these two facts will almost certainly remain true for decades to come. The idea that China will pick up the slack as American and European commitments to decarbonization falter is dangerous wishful thinking. Moreover, it should not be the case that we should expect China to lead. It was us—the UK, US, EU, Canada and similar early-adopters of fossil fuels, cars, and consumerism—that overfilled the atmosphere with GHGs over the past century. China has come late to the fossil fuel party. Asking it to lead the way out the door—asking it to take the lead in decarbonization—is as inappropriate as it is naive. Here’s one last reason why it’s wrong to look for China to lead the way to a zero-carbon future: Per person, China’s emissions are about half of those in Canada and the US (source here). Is it right for those of us neck deep in high-emission consumerist car-culture to look to relatively poor people with relatively low emissions and urge them to “go first” down the road of carbon reduction? 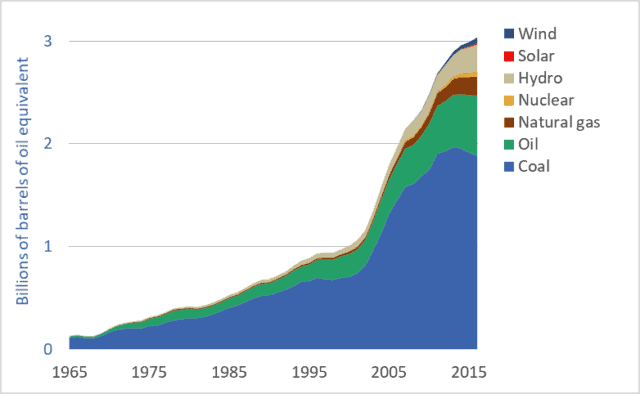 Canadian energy use (primary energy consumption), by fuel or energy source, 1965 to 2016. New reports in highly-respected journals Science and Nature (links here and here) tell us that the world’s economies and societies need to reduce carbon-dioxide emissions to zero before mid-century. This has huge implications for the ways in which we power our cities, homes, food systems, transportation networks, and manufacturing plants. Our civilization must undergo a rapid energy-system transformation, similar in magnitude and effects to previous energy transitions, such as the replacement of wood by fossil fuels in the 18th, 19th, and 20th centuries. Enormous changes are on the way. This multi-decade look at Canadian energy use reveals both good and bad news. Most obvious, it shows that Canada has nearly tripled its overall energy consumption since 1965. Today, on a per-capita basis, Canadians consume more energy than citizens of most other nations. Our very high per-capita energy use will make our energy transition more difficult and costly. On the positive side, our rate of increase in energy use is slowing—the top line of the graph is flattening out. Partly, this indicates that Canadians are using energy more wisely and efficiently. But another factor may be the transfer of heavy industry and manufacturing to other nations; Canadian energy use may be growing more slowly because more of our industrial and consumer goods are made overseas. Also, the graph may not include the full extent of energy consumed in international shipping and aviation. If Canada’s full share of global water and air transport were added, our energy use may appear higher still. The graph has some good news in that fossil fuel use in Canada is declining. Coal, oil, and natural gas provide less energy to our economy today than they did 20 years ago. Coal use, especially, has been cut. On the negative side, any downward trendline in fossil fuel use is not nearly steep enough to intersect zero by 2050. Good news is that Canada already has a large number of low-emission energy sources in place. We are the world’s third-largest producer of hydro-electricity. We also produce significant amounts of electricity from nuclear powerplants. Starting in the 1980s and continuing today, Canada has produced about a third of its primary energy from low-emission sources: including nuclear, hydro, wind, and solar electricity generation. 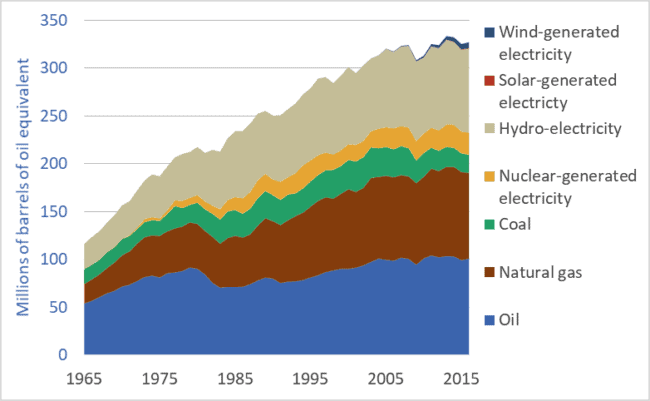 This brings us to perhaps the most important fact revealed by the graph: the very slow rate of installation of new low-emission energy sources—especially solar and wind. Today, solar and wind provide just 2 percent of our primary energy. Indeed, the contribution of solar power is barely visible in the graph. An energy transformation is critical. Global greenhouse gas emissions must peak before 2020 and ramp down sharply, reaching zero three decades later. This will be, by far, the most rapid energy transition in human history. Canadian action so far falls far short of the scale and rate required. P.S. A new book on the history of Canadian energy systems has recently been published. Powering up Canada: A History of Power, Fuel, and Energy from 1600 contains chapters on the energy sources for the fur trade, early horse-powered agriculture, the rise in the importance of coal in Canada, and chapter on the development of the oil and gas sectors. Graph sources: BP Statistical Review of World Energy. Primary energy consumption, by fuel or source, global, 2013-2016. There are many kinds of climate change denial. A minority of people deny that climate change is occurring or serious. This is classic denial. But a much more common and insidious form is all around us: accepting that the problem is real, but pretending that solutions are at hand, underway, or not very difficult. By pretending that Elon Musk’s solar shingles or whiz-bang batteries can provide easy solutions, these people essentially deny the need for rapid, aggressive action. They are wrong. We are not solving the climate change problem. At worst, record high rates of fossil fuel use are locking us into civilization-threatening levels of warming. At best, we are proceeding toward solutions, but far too slowly. What we must stop denying is the need for rapid, aggressive, transformative action. Each year British Petroleum (BP) releases a report and dataset detailing global energy supply and demand. The data includes each nation’s production and consumption of coal, oil, natural gas, hydroelectricity, and other energy sources. Some data extends back to 1965. BP provides one of the most important sources of energy information. The company’s newest dataset—updated to include 2016—was released June 13th. BP’s data shows that 2016 was another record-setting year for fossil fuel use: 11.4 billion tonnes of oil equivalent. See graph above. That same data shows that the rate of solar panel installation is slowing in nearly every nation. The three graphs below are also produced from recently-updated BP data. They show the amount of annual increase in the production and use of solar PV electricity in various countries. This is approximately equal to the annual amount of new capacity added, but it further takes into account how much of any new capacity is actually being utilized. The North American, Asian, and European nations featured in the graphs together host 92 percent of the world’s installed solar generation capacity. 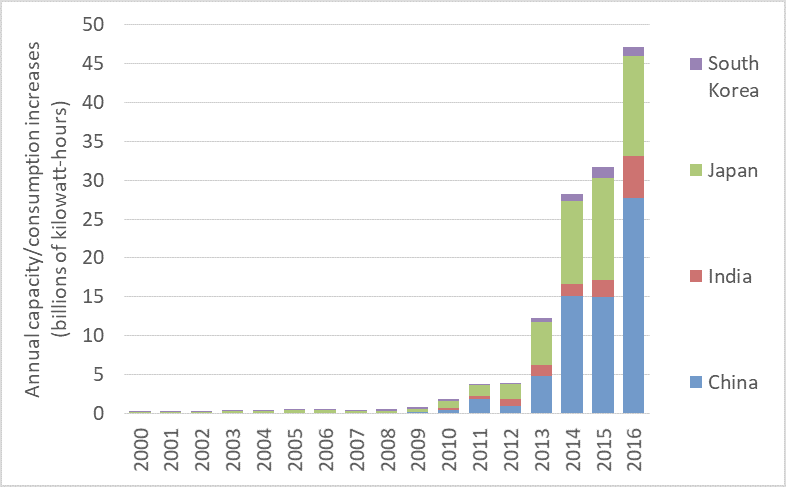 The first of the three graphs shows how much solar PV production/ consumption increased each year in selected EU countries over the past 17 years. It’s bad news: the rate of additions to solar power consumption peaked in 2012 and has fallen dramatically since then. The graph shows that the rate at which EU countries are installing solar panel arrays has collapsed since 2012. Progress toward renewables is decelerating. Further, note how each individual country accelerated its installation then slowed. Spain, represented by the green bars, ramped up installation of solar panel arrays in 2008 and ’09. After that, solar PV additions to Spain’s grid fell sharply, and rallied in only one year: 2012. Germany’s solar installations followed a similar trajectory. In that country, annual increases in solar power production and consumption grew until 2011, then began falling. Additions to solar power production and consumption in Italy peaked in 2011 and have been falling ever since. Nearly every EU nation is slowing the rate at which they add solar power. The next graph shows production/consumption additions in the US and Canada. The rates of new additions in those countries also appears to be sputtering. The final graph shows the rate of production/consumption increases in China, India, Japan, and South Korea. Clearly, capacity and consumption are rising rapidly in Asia. But note that rates of installation are increasing only in China and perhaps in India. One EU-based analyst told me that in recent years China ramped up solar-panel production to serve markets in the EU and elsewhere. But when demand in those markets contracted, faced with a glut of panels coming out of Chinese factories, the government there pushed to install those panels in China. Perhaps that isn’t the entire story. It may be that China’s world-leading solar install rates are partly caused by a visionary concern for the environment and the climate, and partly by the need to absorb the output of Chinese PV panel factories left with surpluses after other nations failed to maintain installation rates. Together, these four graphs tell a disturbing story. 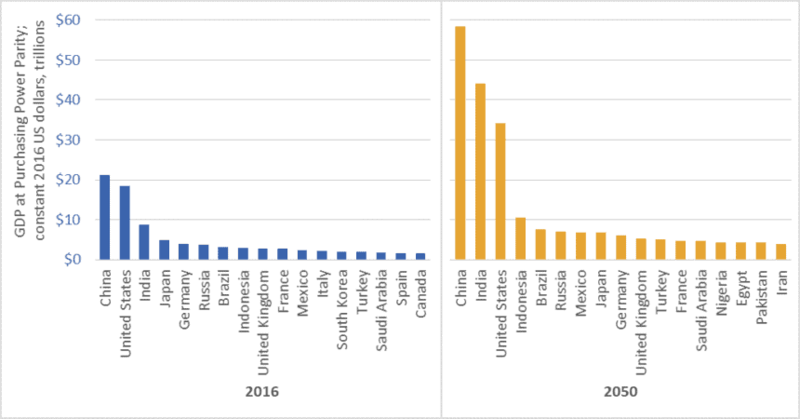 Instead of accelerating rates of solar panel installations, we see stagnation or decline in nearly every nation other than China. This comes along-side record-high fossil fuel use and record-setting CO2 emissions. We’re failing to act aggressively enough to decarbonize global electricity systems and we are largely ignoring the project of decarbonizing our overall energy systems. Rather, we’re increasing carbon emissions. 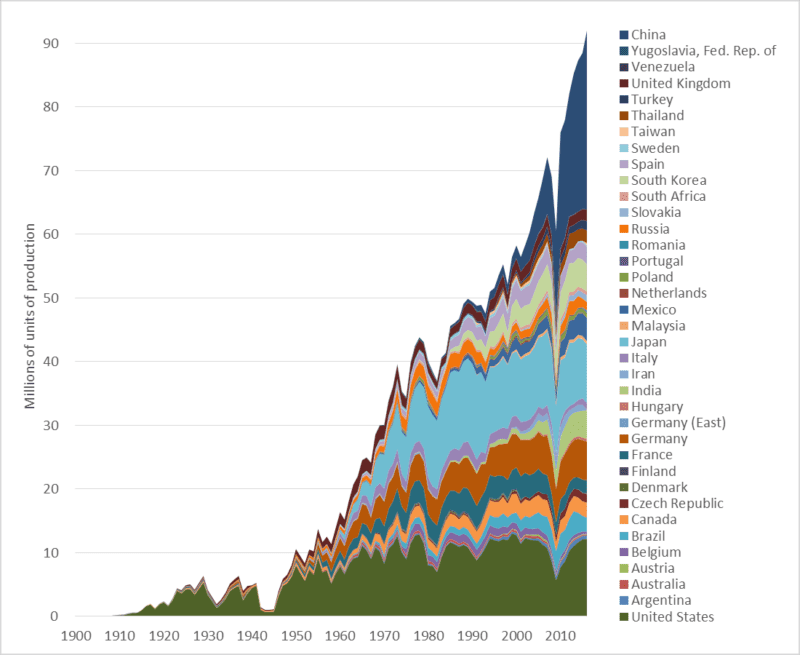 And as we do so, we risk slamming shut any window we may have had to keep global temperature increases under 2 degrees C.
This week’s graph shows global automobile production over the past 116 years—since the industry’s inception. The numbers include car, trucks, and buses. The graph speaks for itself. Nonetheless, a few observations may clarify our situation. 1. Global automobile production is at a record high, increasing rapidly, and almost certain to rise far higher. 2. Annual production has nearly doubled since 1997—the year the world’s governments signed the Kyoto climate change agreement. 3. China is now the world’s largest automobile producer. In terms of units made, Chinese production is double that of the United States. This graph tells us something about the ascendancy of China. 4. Most of the growth in the auto manufacturing sector is in Asia, especially Thailand, India, and China. In 2000, those three nations together manufactured 3 million cars. Last year their output totaled 34 million. After 67 years of production, Australia is about to shut down its last automobile plant. Most of its cars will be imported from Thailand, and perhaps a growing number from China. 5. Auto production in “high-wage countries” is declining. As noted, the Australian industry has been shuttered. US production is down 5 percent since 2000, and Canadian production is down 20 percent. Over that same period, production fell in France, Italy, and Japan, though not in Germany. Since 2000, auto production increases in Mexico (+1.7 million) are roughly equal to decreases in Canada and the US (-1.2 million). 6. There are some surprises in the data: Turkey, Slovakia, and Iran all make the top-20 in terms of production numbers. Electric cars are coming… Fast! When- and wherever it occurs, exponential growth is transformative. After a long period of stagnation or slow increase, some important quantity begins doubling and redoubling. The exponential growth in cloth, coal, and iron production transformed the world during the Industrial Revolution. The exponential growth in the power and production volumes of transistors (see previous blog post)—a phenomenon codified as “Moore’s Law”—made possible the information revolution, the internet, and smartphones. Electric cars and their battery systems have now entered a phase of exponential growth. There are two categories of electric vehicles (EVs). The first is plug-in hybrid electric vehicles (PHEVs). These cars have batteries and can be driven a limited distance (usually tens of kilometres) using electrical power only, after which a conventional piston engine engages to charge the batteries or assist in propulsion. Well-known PHEVs include the Chevrolet Volt and the Toyota Prius Plug-in. The second category is the battery electric vehicle (BEV). Compared to PHEVs, BEVs have larger batteries, longer all-electric range (150 to 400 kms), and no internal combustion engines. Well-known BEVs include the Nissan Leaf, Chevrolet Bolt, and several models from Tesla. The term electric vehicle (EV) encompasses both PHEVs and BEVs. The graph above is reproduced from a very recent report from the International Energy Agency (IEA) entitled Global EV Outlook 2017. It shows that the total number of electric vehicles in the world is increasing exponentially—doubling and redoubling every year or two. In 2012, there we nearly a quarter-million EVs on streets and roads worldwide. A year or two later, there were half-a-million. By 2015 the number had surpassed one million. And it is now well over two million. Annual production of EVs is similarly increasing exponentially. This kind of exponential growth promises to transform the global vehicle fleet. But if it was just vehicle numbers and production volumes that were increasing exponentially this trend would not be very interesting or, in the end, very powerful. More important, quantitative measures of EV technology and capacity are doubling and redoubling. This second graph, below, taken from the same IEA report, shows the dramatic decrease in the cost of a unit of battery storage (the downward trending line) and the dramatic increase in the energy storage density of EV batteries (upward trending line). If we compare 2016 to 2009, we find that today an EV battery of a given capacity costs one-third as much and is potentially one-quarter the size. Stated another way, for about the same money, and packaged into about the same space, a current battery can drive an electric car three or four times as far. Looking to the future, GM, Tesla, and the US Department of Energy all project that battery costs will decrease by half in the coming five years. Though these energy density increases and cost decreases will undoubtedly plateau in coming decades, improvements underway now are rapidly moving EVs from the periphery to the mainstream. EVs may soon eclipse internal-combustion-engine cars in all measures: emissions, purchase affordability, operating costs, performance, comfort, and even sales. Global economic activity, energy use, and carbon dioxide emissions, 1CE to 2015CE. My friends sometimes suggest that I’m too pessimistic. I’m not. Rather, I’d suggest that everyone else is too optimistic. Or, more precisely, I live in a society where people are discouraged from thinking rigorously about our predicament. The graph above sets out our civilizational predicament, and it hints at the massive scale of the transformation that climate change requires us to accomplish in the coming decade or two. The main point of the graph above is this: Long-term data shows that the size and speed of our global mega-civilization is precisely correlated with energy use, and energy use is precisely correlated with greenhouse gas emissions. We have multiplied the size of our global economy and our living standards by using more energy, and this increased energy use has led us to emit more carbon dioxide and other greenhouse gases. The graph plots three key civilizational metrics: economic activity, energy use, and carbon dioxide (CO2) emissions. 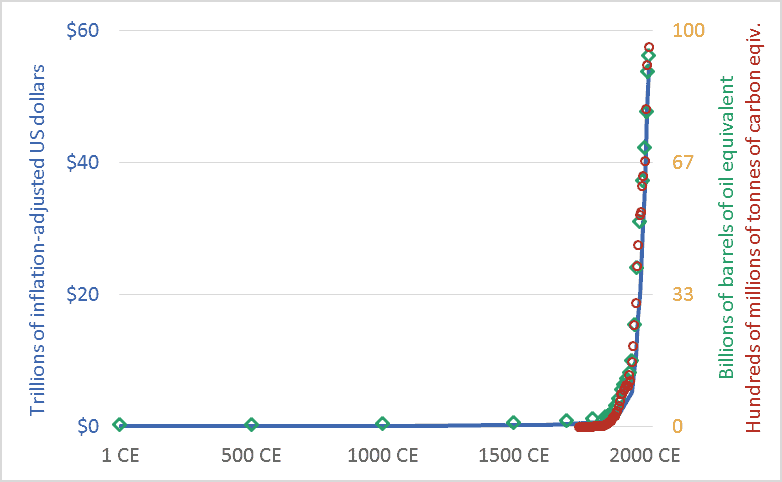 The graph covers the past 2015 years, the period from 1 CE (aka 1 AD) to 2015 CE. The blue line depicts the size of the global economy. The units are trillions of US dollars, adjusted for inflation. The green diamond-shaped markers show global energy use, with all energy converted to a common measure: barrels of oil equivalent. And the red circles show global CO2 emissions, in terms of tonnes of carbon. Though it is seldom stated explicitly, most government and business leaders and most citizens are proceeding under the assumption that the economic growth line in the graph can continue to spike upward. This will require the energy line to also climb skyward. But our leaders are suggesting that the emissions line can be wrenched downward. When people are “optimistic” about climate change, they are optimistic about doing something that has never been done before: maintaining the upward arc of the economic and energy trendlines, but somehow unhooking the emissions trendline and bending it downward, toward zero. I worry that this will be very hard. Most important, it will be impossibly hard unless we are realistic about what we are trying to do, and about the challenges and disruptions ahead. GHGs: Boden, T.A., Marland, G., and Andres R.J., “Global, Regional, and National Fossil-Fuel CO2 Emissions,” Carbon Dioxide Information Analysis Center (CDIAC), Oak Ridge National Laboratory, U.S. Department of Energy, Oak Ridge, Tenn., U.S.A.
Energy consumption: Vaclav Smil, Energy in Nature and Society: General Energetics of Complex Systems (Cambridge, MA: The MIT Press, 2008); British Petroleum, BP Statistical Review of World Energy: June 2016 (London: British Petroleum, 2016); pre-1500 energy levels estimated by the author based on data in Smil. 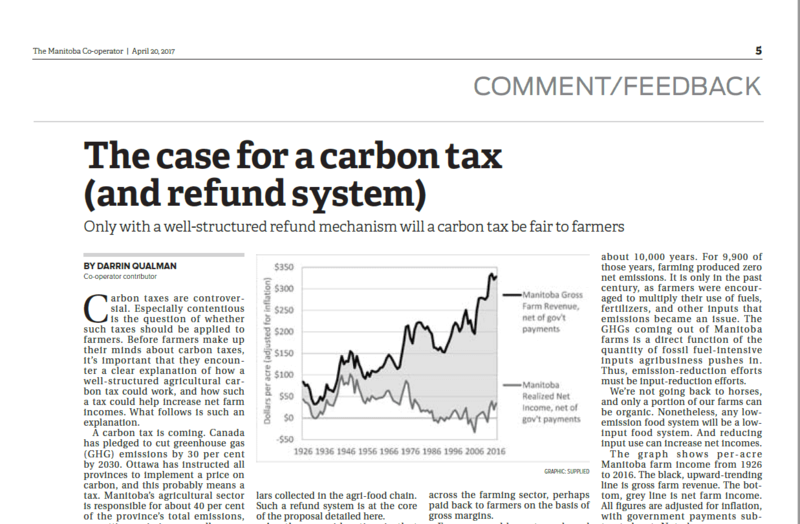 On April 20, 2017, the Manitoba Co-operator published my editorial outlining a positive model of a carbon tax on farmers and agriculture. An agricultural carbon tax can reduce emissions and increase incomes.